When Winchester described the majesty of the Yantze River, along with its unbridled power and the regularity of floods (above), I was moved by the spirit to go. Mitch did most of the research, found the cruise line, arranged the booking. I thought I knew a bit about cruises: fake gold railings, terrible art, romantic red carpet. At to a certain point, it led up to all of my expectations, with the highlight being the dumplings and peanut butter toast they would feed me for breakfast. Suffice to say, what mattered the most was certainly not on the boat. It was off the boat, in the glorious, mystic vigor of the Yantze; a river that gives life to all that depend on its shores, and one long controlled by the Communist Party of China. 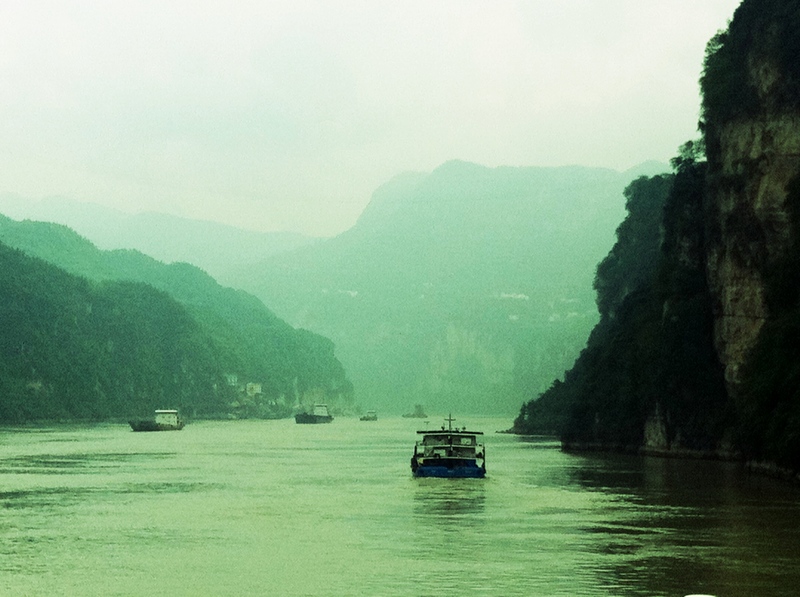 See Mitch’s post on the Three Gorges Project on his blog, The Culture Bucket. Our voyage took us on a four day downstream trip from riverside Yichang (great views) to the megacity of Chongqing, population 30 million. At fisrt cruising the Yantze was a romantic concept for me, but this was soon replaced by the realism of the culture which depends partly on it. Several smaller “out trips” are arranged off the ship with local guides: the group is red tagged, organized, and shuffled on and off, expecting to remember the experience with a fantastic array of Yantze souvenirs. This part of the trip irked my adventure spirit a little, and furthermore, being contained in a small room with a five year old, is, well let’s say, a once in a lifetime experience. We hope. We didn’t spend much time in Chongquin, where the tides were rising and the reports were coming in of flooding downstream. Instead, we boarded a place to Guilin, on the Li River, in the smaller, more remote and picturesque region of Guangxi province, China. 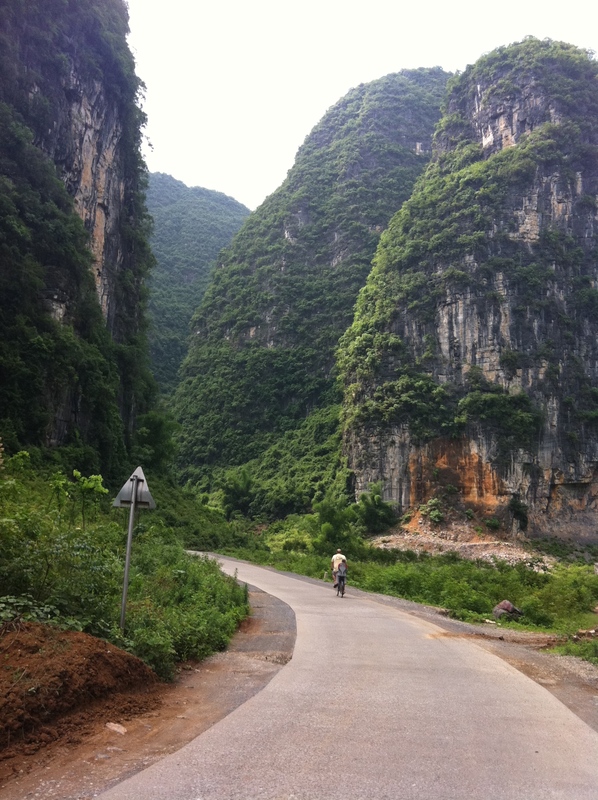 We’re talking karst hills up the yin yang, here, giant limestone hills formed over millions of years. This is pretty exciting stuff for me, coming from Prince Edward Island. I mean, the place is the practically a sand bar. But I guess that sand dunes are dramatic… in their own way. 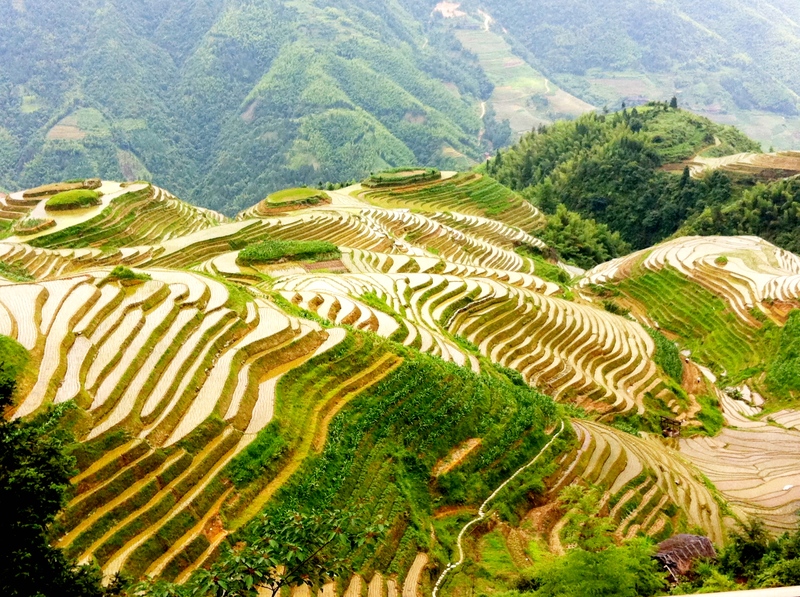 North of the town of Guilin are Longji Rice Terraces, some of the most impressive rice terraces that I have ever seen. The trek to the village of Ping An was totally worth it, and when we got to the top, the views were absolutely spectacular. You can only go so far by car and then you must go by foot, as there are no roads in the town per say, only foot paths. This can be a bit disorienting when you’re not sure where you’re going or how long it may take to get there, but you just have to pray to the gods of family travel that they’ll be something amazing for the little one at the end (I promise you Leila, they have ice cream!). 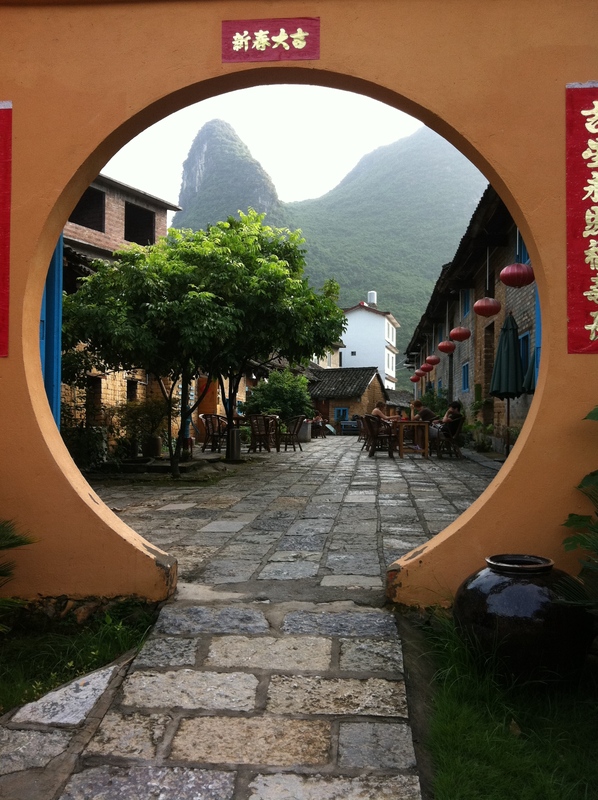 The path just keeps winding up and up and up, and for once in China, the locals don’t even give you a second glance. They’re used to trekkers here, and they’ll even sell you one of those much unneeded european walking sticks if you want one. Hand dyed fabrics, crafts, dried chili peppers and fruit stands all adorn the path up. And when you get there, man, is it worth it. Three days in the village wasn’t even close to being enough. What an amazing way to end our five weeks in China – with spectacular views and everything coming into perspective: how much there is between western and chinese culture, but more importantly, how fundamentally we are the same. Shanghai was a perfect exit for our last days in China, a cosmopolitan city with plenty of international flair, where many restaurant waiters and shopkeepers even speak english (A real treat for my tired, poor Mandarin.). Mitch showed us all the sights as he already has his favorites, as he’s visited the city three times before. So that was perfect: a built in city guide. Me and Lei basically just had to take it all in – and then there was the little matter of packing that suitcase. I like arm chair traveling with you as the guide. Thanks for sharing. Let me put it this way, Jan. 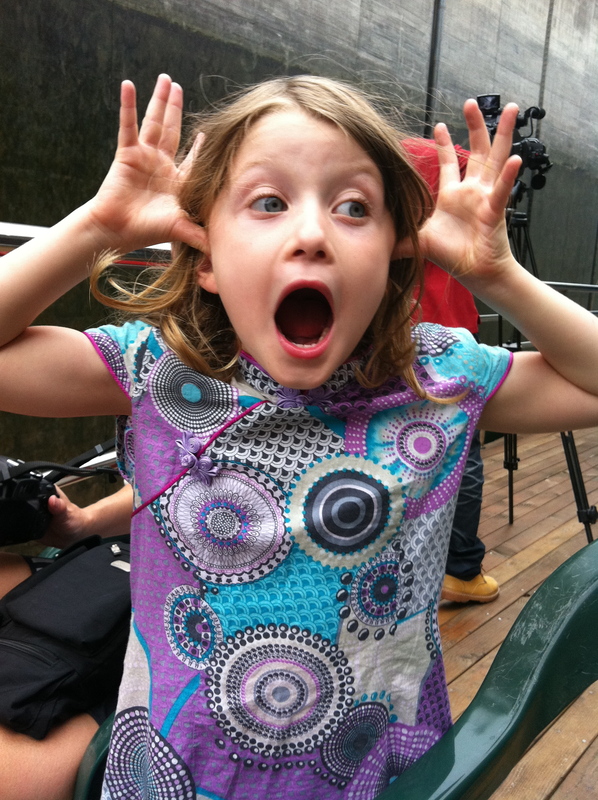 When people ask her how China was, she tells them how great the ice cream was! Thanks for visiting FurtherMo, Dannie. The river in Yangshuo/Guilin was actually called Li River. And I guess I’m showing my age here – “up the yin yang” is a quote from The Simpsons! Gorgeous pictures and a fantastic adventure. Can’t wait to give you a hug! Welcome home!